SINGAPORE, April 4, 2013 (ENS) – The governments of Indonesia and Malaysia today agreed for the first time to collaborate on saving the Critically Endangered Sumatran rhino, the smallest and last form of the two-horned rhino in Asia that has lived on the planet for 20 million years. 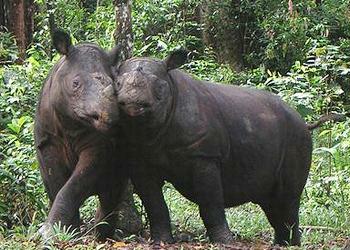 The last wild populations of Sumatran rhino, Dicerorhinus sumatrensis, amount to fewer than 100 rhinos in total. They survive on the Indonesian island of Sumatra and in Sabah, Malaysia on the northern part of the island of Borneo. The agreement was reached at the Sumatran Rhino Crisis Summit convened by the International Union for Conservation of Nature’s Species Survival Commission (IUCN SSC) at the Singapore Zoo with a wide range of international and national organizations. Experts gathered at the summit proposed a two-year emergency action plan as an immediate follow-up to the event. The two governments now need to formalize the collaboration and agree on the next steps to tackle the Sumatran rhino crisis, brought on by an increase in illegal hunting and consumer demand for rhino horn. Datuk Dr. Laurentius Ambu, director of the Sabah Wildlife Department, detailed some of the initiatives the two countries will take to conserve the last Sumatran rhinos. “We would like to reiterate Sabah’s commitment and our willingness to further discuss with Indonesia opportunities to exchange reproductive cells of the species, move individual rhinos between our countries and to employ advanced reproductive technology as a parallel initiative in the Sumatran rhino captive breeding program,” he said. Dr. Ambu made this pledge to more than 130 rhino experts, scientists, government officials and representatives of nongovernmental organizations from around the world gathered in Singapore this week to address the Sumatran rhino crisis. They made their plans in view of lessons learned from previous conservation successes of other rhinos and species such as the Californian condor, the black-footed ferret and Hawaiian forest birds. “Serious steps must be taken to roll back the tide of extinction of the Sumatran rhino,” said Widodo Ramano, executive director of the Indonesian Rhino Foundation, Yayasan Badak Indonesia, a nongovernmental organization. “This could be our last opportunity to save this species and, by working together as a collaborative unit, internationally and regionally, with an agreed vision and goals, a glimmer of hope has been clearly demonstrated,” he said. “We need to act together urgently, hand in hand, replicating some of the inspirational successes of other conservation efforts and aim to stop any failures that might impede progress,” Ramano said. “The Sumatran Rhino Crisis Summit has been transformational by bringing together the two governments whose representatives committed to positive and proactive bilateral collaboration which is critical for saving this enigmatic species,” says Mark Stanley Price, chairman of the IUCN SSC Species Conservation Planning Sub-Committee. Summit participants were encouraged by the agreement, although the recent past history of rhinos has been bleak. Since 2010, two rhino subspecies, the Western Black Rhinoceros, Diceros bicornis longipes, in Cameroon and the Indochinese Javan Rhinoceros, Rhinoceros sondaicus annamiticus, in Vietnam have gone extinct. The Sumatran Rhino Crisis Summit was hosted by Wildlife Reserves Singapore Group, while Sime Darby Foundation, World Wildlife Fund, IUCN SSC, the International Rhino Foundation, the Association of Zoos Se Indonesia, and Taman Safari Indonesia provided funds and resources. Those looking for positive signs of rhino survival got some good news last week when WWF-Indonesia announced that its monitoring team found traces of fresh rhino tracks earlier this year while monitoring orangutans on the island of Borneo. The tracks were found in Kutai Barat, Kubar, East Kalimantan, in the Heart of Borneo, a WWF conservation area. Rhino experts at WWF-Indonesia and wildlife researcher from the University Mulawarman Dr. Chandradewana Boer, confirmed that the species is likely the Sumatran rhino. These findings bring fresh air to the world of national and international conservation, given that the presence of Sumatran rhinos has never been detected in this area of Borneo. 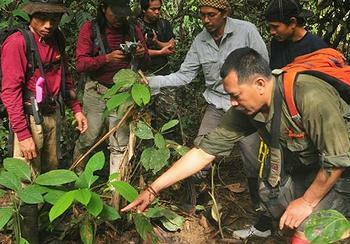 “This discovery is very important for the world, especially for the conservation of Indonesia, because it is a new record of Sumatran rhino presence in East Kalimantan, especially in the Kubar area,” said Bambang Novianto, director of biodiversity conservation with Indonesia’s Ministry of Forestry. “This information is important for the existence of the protection of the population and development strategies in rhino habitat areas,” said Bambang. According to him, in the future, required the cooperation of many parties, including local communities, corporations, and others to take appropriate measures for the conservation of Sumatran rhino in Borneo. WWF-Indonesia Conservation Director Nazir Foead, said, “WWF-Indonesia with related parties, including the Ministry of Forestry and Kubar government, will undertake a more comprehensive follow-up survey to map the rhino habitat preferences and population in West Kutai.” Based on the results of the survey, strategies and action plans can be formulated.